The Queen hosted a 70th birthday party for The Prince of Wales tonight at Buckingham Palace. Tonight's party for Prince Charles was deemed a private event and no pictures were released from inside, mainly leaving us with a few car photos of guests arriving - except, of course, for the birthday boy himself. 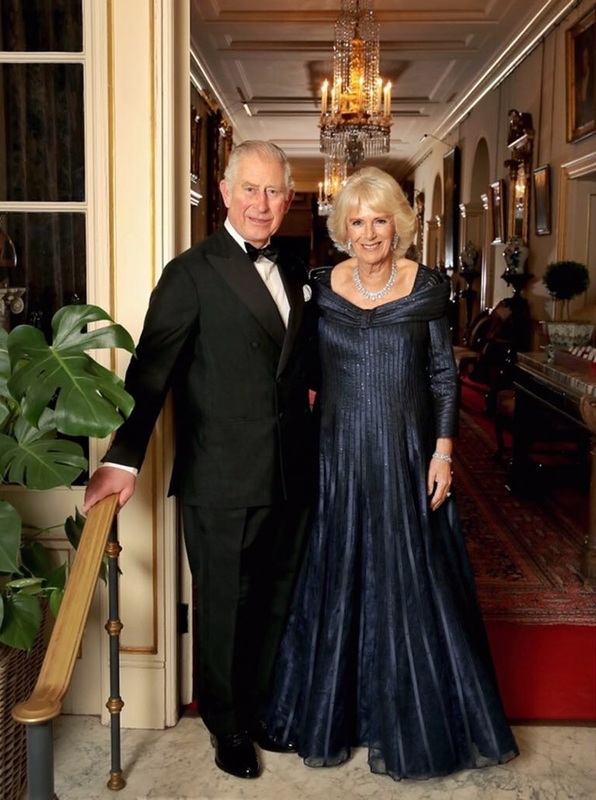 Charles and Camilla posed for a portrait before leaving Clarence House. The Duchess wore a new navy gown by Bruce Oldfield with her Pear Drop Diamond Demi-Parure and her favorite diamond bracelet. The necklace and earrings have been among her favorite jewels in her marriage, and with good reason. A fabulous glittering look for them both! “It is a privilege for any mother to be able to propose a toast to her son on his 70th birthday. It means that you have lived long enough to see your child grow up. It is rather like - to use an analogy I am certain will find favour - planting a tree and being able to watch it grow. My mother saw me turn 70, of course. And she was heard to observe that 70 is exactly the age when the number of candles on your cake finally exceeds the amount of breath you have to blow them out. Over his 70 years, Philip and I have seen Charles become a champion of conservation and the arts, a great charitable leader - a dedicated and respected heir to the throne to stand comparison with any in history - and a wonderful father. Most of all, sustained by his wife Camilla, he is his own man, passionate and creative. From the other two top duchesses in the family, we got a duo of mystery earrings. The Duchess of Sussex wore the pair of earrings she debuted at a dinner in Fiji on the couple's recent tour. It was said that they are borrowed - but the palace declined to specify from whom they were borrowed. Since they usually say when things come from The Queen, I'm inclined to believe these are not from HM's vault. Time might tell, I guess. The Duchess of Cambridge wore a big pair of pink-toned earrings last seen at the BAFTA Awards in 2016. There has been some question if these are costume pieces; I don't think so, particularly given their appearance here. These are in Kate's collection, not borrowed from The Queen. As for the other guests: the Norwegian royal family posed for a photographer on their way to the party. That's about it so far. Car pictures all around! Typical of the Windsors, what can you say.